← Flying the flag for Britain. Glastonbury Tor from Ham Wall at sunrise. Only twenty years ago one could reasonably expect to see a grey heron or two at a wetland in southern England and possibly the one of the first little egrets to arrive on these shores. How things have changed! Little egrets can now be seen all over the south, and several other heron species have arrived in Britain since then. Spoonbills nest in Norfolk and probably elsewhere, and it cannot be long before glossy ibis nests in the UK. The great white egret, previously a rare vagrant, has been breeding on the Somerset Levels (a.k.a. the Avalon Marshes) for several years, and may well do so elsewhere. Cattle egrets have nested there and even little bitterns. To avoid confusion it is now necessary to refer to its larger relative as the “greater bittern” instead of plain “bittern”; and there are now more of them in the Avalon Marshes than there were in the whole of Britain at the end of the last century. The conversion of large areas of redundant peat cuttings into reedbeds has created what could accurately be described as U.K. Heron H.Q. The RSPB has a fabulous reserve (Ham Wall) there and is constantly adding new areas of land to its holding. It might be a massive corporate behemoth beset by unpleasant internal practices but, boy, does the RSPB do a good job when it comes to habitat creation! Great white egret over the Avalon marshes. In a previous post I wrote about a trip to the Somerset Levels in winter, where I photographed starlings and great white egrets. Earlier this week I spent a couple of days around Ham Wall and what a great place it is! My internal clock woke me about 4 a.m on the first morning and from the van I could see wisps of low fog in the air. I wasted no time (well, maybe a little….) in getting myself up and on to the reserve. It was a gorgeous, atmospheric morning, with misty conditions throughout; the iconic shape of Glastonbury Tor, with its tower, was often visible, and this was my first photographic objective (see above). It was soon sunrise and birds were leaving roost sites and moving to feeding areas in the marshes. I tried to include over-flying birds in these early morning landscapes even if they were quite small in the viewfinder. It was particularly noticeable how many great white egrets there were, and I saw several greater bitterns in flight. Despite being extraordinary birds in themselves I can’t get too excited about the appearance of the latter in flight, while the former are delightful. As the morning sun rose and burned away the mist the landscape began to look a little more ordinary. Mid-June is not the greatest time of year for landscape photography but there was still plenty of interest bird-wise. 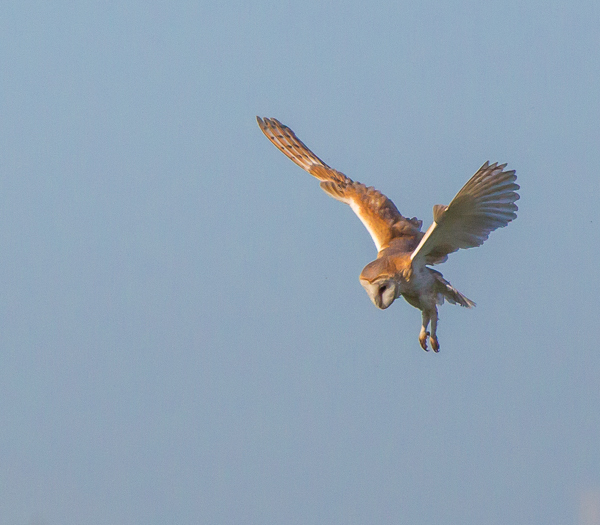 A barn owl was hunting in broad daylight near one of the hides and flying past with prey – a nest nearby, no doubt. I’ve never been that good at birds-in-flight so it was a bonus to find that a few images I took of it are reasonably sharp! It is usually possible to have an exchange of information with other birders and I think most enjoy it. But with rare species, especially if they are nesting, there’s so much misinformation around. You just don’t know who or what to believe. Was the guy in the welcome hut – no doubt anxious to keep visitor numbers up – being honest about the red-footed falcon that had apparently been seen earlier? The Ham Wall recent sightings blog made no mention of little bitterns, but despite that were they back again this year? So after a well-deserved (I thought) and rather lengthy siesta I headed back on to the reserve in the late afternoon from the Glastonbury end. It wasn’t long before I came across a gaggle of birders standing by the main track looking into the reeds. This looked like a gathering. Had I stumbled onto the location of the legendary little bittern? At first my attempts to ascertain this were met with a rather frosty silence. But soon it emerged that yes, I had. It had been heard there earlier in the day and seen briefly. I waited around for an hour or more but all was quiet; it was time to move on. Greater bitterns had been booming on and off all day and it was the first time I had heard the “in-breath” and really got to grips with the sound. If all else failed I was also hoping to hear the “bark” of the little bittern; sometimes the sound of an elusive bird’s song can be enough; you know it is there somewhere and it all adds to the sum of one’s knowledge of wildlife. So I stopped at the same section of reedbed on the way back to the van and listened. And there it was – a regular, nay, monotonous single note repeated every two seconds exactly. After half an hour of listening I saw a movement low over the reeds – a stunning male little bittern. The sighting lasted just about second, but I was elated. The barking resumed from the reeds in the direction the bird had disappeared in. My second morning at Ham Wall was similar. Misty, still, and full of birds. Below the Avalon Hide marsh harriers were just arising and stretching their wings. (In fact, I later discovered that the three birds I saw together were probably one male and his two females…..) The barn owl was still hunting the same area. A cuckoo was very active. The little bittern was still calling, and there seemed to be assorted other heron species everywhere. What a sight and sound! This entry was posted in Uncategorized and tagged avalon marshes, bird, bittern, greater, ham wall, heron, herons, landscape, little, photography, somerset levels. Bookmark the permalink. 1 Response to Birding at Heron H.Q. It’s good to know that there is such a wealth of birds flocking here. We have a lone grey heron that hangs around one of the local parks – I don’t know if s/he has a mate and a nest somewhere nearby. The images are beautiful, great catch of the owl in flight and I love the misty tor.